The kit includes 2 x 24vdc electro mechanical rams to automate a pair of gates and conforms to requirements specified in BS EN12453. 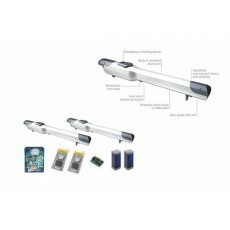 This system has limit switches and provides the facility for slow down in opening and closing. The limit switches must be used for the correct operation of the system however this allows installation without ground stops thus reducing the actual installation work.